If there’s anything I’ve learned from my time living in the Valle de Elqui, it’s that I have most definitely become a city girl. While living in an idyllic mountain location can be restorative, I find myself inspired by each visit to Santiago, where even just wandering the streets sparks creative ideas. When I signed up for a year here, I thought I would love visiting La Serena, a city touted as an ideal expat base due to its mild climate, proximity to the beach, and wide variety of services, such as a sizeable mall and two superstores. It is also only 5 or 6 hours from Santiago, which is convenient for any necessary visit to the capital. It’s funny how small decisions can have a greater impact later on in life. 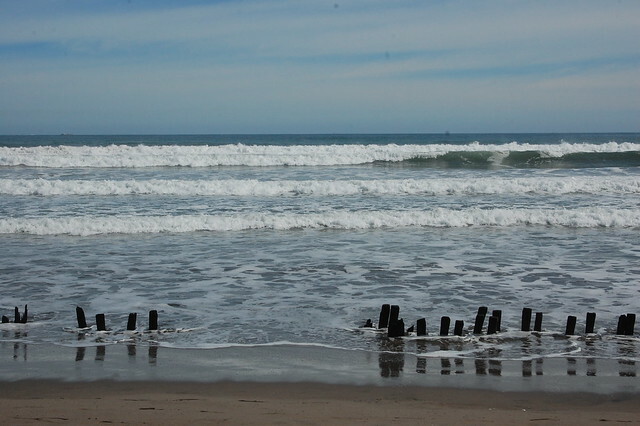 When I took the 32 hour bus ride from Santiago to Arica back in 2013, I considered stopping in La Serena to break the very long trip, lured by my guidebook’s enthusiastic description of its charms. But six hours just wasn’t enough of a dent into the day-plus journey, so I opted to power through and go straight to Arica. 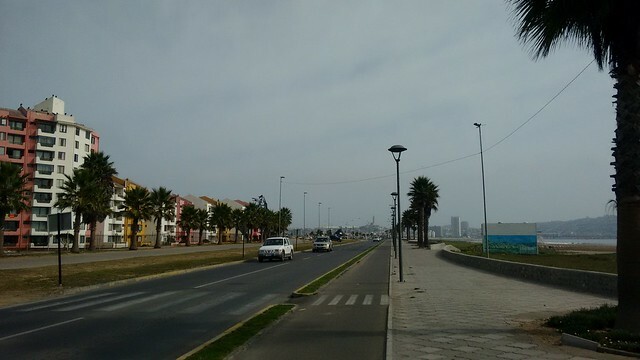 From my limited vantage point on the Panamerican highway, La Serena seemed like a pretty cool city. 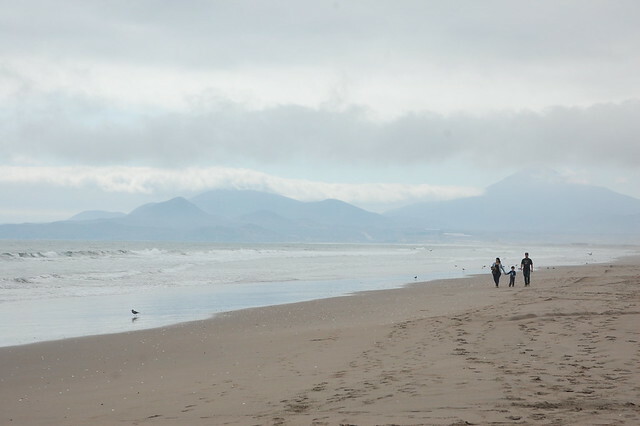 Imagine if I had spent a day or two exploring La Serena? I may not be where I am today. There are few cities I don’t like (Huanuco, Peru is at the top of the list), but unfortunately, La Serena is one of them. Even still, I have tried to get to know La Serena as more than a transit hub, the place I have to go every so often to process my visa paperwork, and home to high speed internet and massive supermarkets. In May, I spent a Chilean holiday weekend staying in the city, walking and biking along the beach, and even trying to take in some nightlife. I ended up shattering my cell phone screen, getting the seat stolen off my rented bike, and offending a local with my controversial opinions about living in Chile. Needless to say, La Serena and I have a challenging relationship. That said, La Serena does have some redeeming factors. When the sun is shining brightly (more rare than you would expect due to the proximity of the mountains), the colonial buildings provide an attractive landscape for relaxed wanderings around the city center. The Plaza de Armas often hosts fairs where you can get regional food like churrascas or fresh juice, along with artisan crafts. There are hidden corners like the Patio Colonial filled with neat stores selling looseleaf tea, roasted nuts, essential oils, etc. There are at least two vegetarian restaurants where you can get a healthy meal, Pachamama Comida Sana and Ayawasi (see my recommendations, below). There are a number of cafes with outdoor seating catering to the locals along with a cute Western-style cafe, the Lighthouse Cafe. There are also a couple of interesting museums which give you an insight into local culture, which are a good place to head on a cloudy or chilly day. Since La Serena’s city center is about a 20 minute walk from the beach, a visit to the Avenida del Mar can give you a sense that you are in another city and can be quite relaxing as it is located a good distance away from the heavy traffic of the Panamerican highway. On a sunny day, this is a pleasant stroll with a handful of small restaurants catering to tourists. 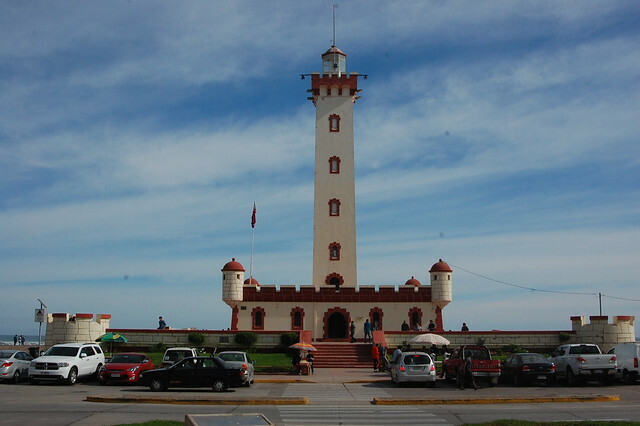 The major destination is El Faro, or the lighthouse, located at the end of Francisco de Aguirre. 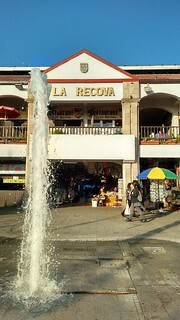 In the city center, La Recova is a popular destination for tourists. At ground level, it is lined with stalls offering mass-produced artisan wares akin to what you can find in nearby Peru and Bolivia at a fraction of the price. If you look closer, they also sell La Serena’s regional speciality, papaya. You can find preserved papaya, candied papaya, papaya with nuts, you name it. Chile’s papaya variety is different from any I have had before, so even if you’re not usually a fan of the fruit (like me), it’s worth a taste or two. On the top floor of La Recova’s market, there are a number of restaurants dedicated to serving a wide variety of seafood. If, like me, that’s not your thing, La Recova also hosts fast food stands with empanadas and other quick meals. For budget travelers, nearby Calle Vicuña, has a number of low budget hostels, which cannot be particularly recommended but which are a decent option for a night. You also have the option of biking from La Serena to Coquimbo, as much of the route is on protected bike paths or sidewalks. We rented our bikes from a small family business near La Recova, but if you just want a short ride, there are bikes for rent by the hour along the bike path. 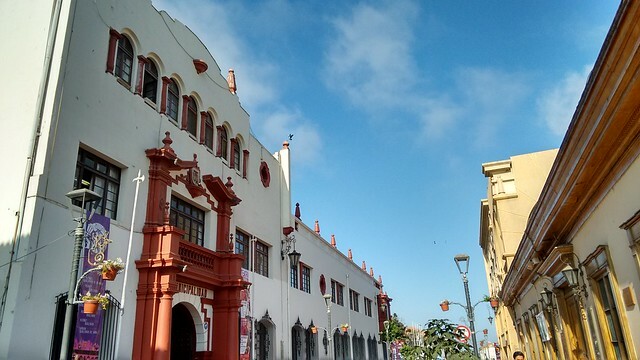 Nearby Coquimbo has a busy, bustling fish market atmosphere which is a nice break from the cool, distant demeanor of many residents of La Serena. 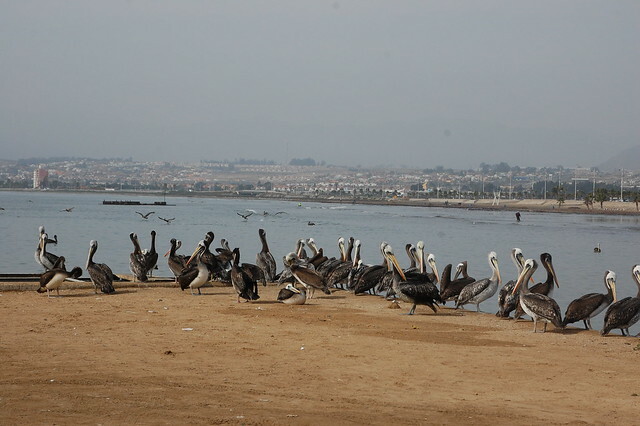 Due to the aforementioned bike seat robberies, I did not get to spend much time exploring Coquimbo, but I did enjoy watching the pelicans and seabirds. 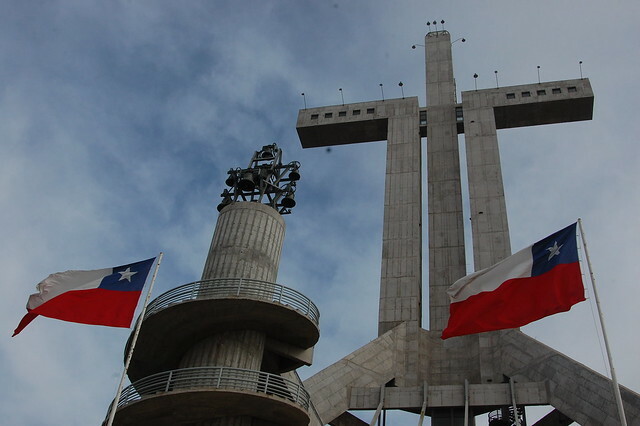 In Coquimbo, the big tourist destination is the Cruz del Tercer Milenio, a huge cement church complex located at one of the highest points in the city. From the top, you can look out at the brightly painted houses coating the hillside of Coquimbo, which are remiscient of the views you get in Valparaíso. 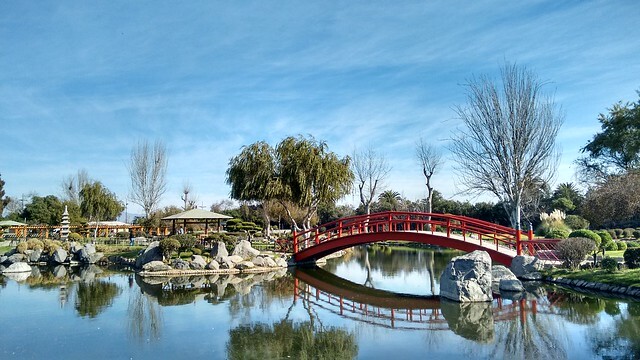 Finally, La Serena has a lovely Japanese garden, Parque Jardín del Corazón, located close to the bus terminal and malls, which is a welcome escape from the hectic activity along the Panamerican highway (even if you can still hear the traffic during your stroll around the carefully curated landscape). 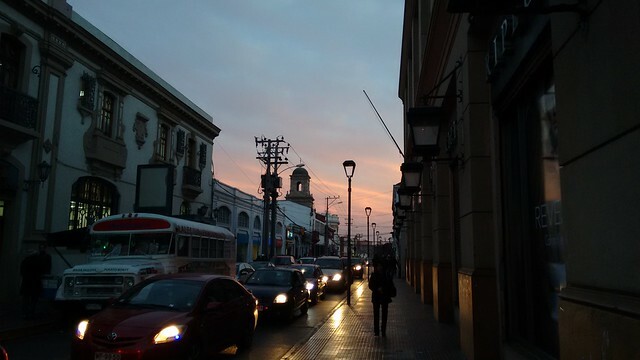 I know it is hard to believe that someone who loves the sprawling urban chaos of Lima could feel so ambivalent about the compact, organized, similarly colonial city of La Serena, but así es. As I’ve said before, this has indirectly benefited me because I spend less time and money heading to La Serena than I originally expected to, so I have learned to take advantage of my current home in a way I might not have otherwise. 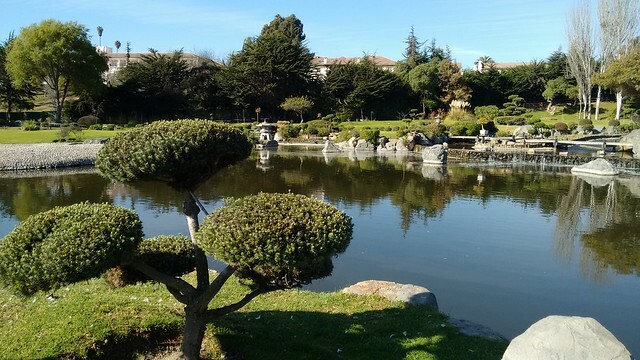 • If you are spending a few nights in La Serena, I highly recommend Hostal El Arbol, located in a quiet neighborhood next to the Japanese garden. It is within walking distance of the bus terminal, close to the beach, and also near the city center. • If El Arbol is booked up or a little too pricey, you can try the street of hostels located near La Recova. 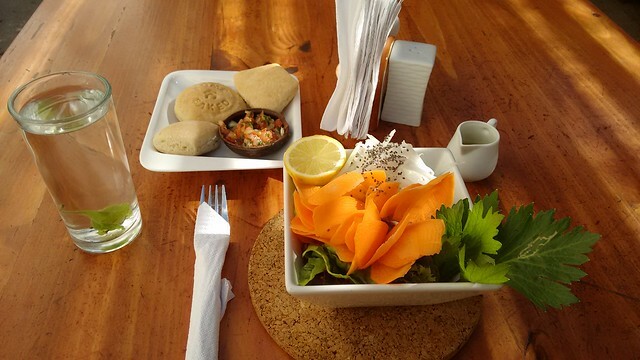 • For vegetarians, La Serena has at least two vegetarian restaurants. Pachamama Comida Sana, located at Cordovez 490 in the commercial center, offers fixed price lunches at $2500, as well as juice and other cafe treats. The meals are on the smaller side but healthy. Ayawasi, located at Pedro Pablo Muñoz 566, near the Plaza de Armas and Japanese garden, has more plentiful meals for $3500. • The Museo Arqueológico in La Serena is worth a visit to get a sense of the pre-Colombian cultures in the area, particularly the Diaguitas, who inhabited the Valle de Elqui. There you can also find a much-abused moai from Easter Island and other Rapa Nui artifacts. Admission is free as of writing. 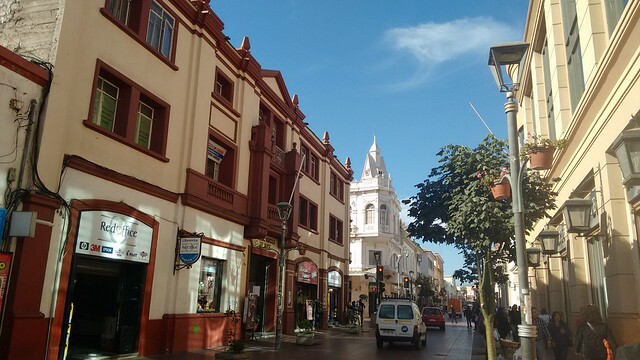 • La Serena has plentiful shopping options with stores lining its two main streets, Prat and Cordovez. There are two malls located nearby on the Panamerican highway, as well as two superstores, Jumbo and Líder. For more niche shopping, try the Patio Colonial, which has a number of intriguing stores selling loose leaf tea, nuts and grains in bulk, aromatherapy, and other interesting wares. • La Serena has a strong cafe culture, and you can’t wander around the city center without tripping over an outdoor cafe. For foreigners looking for a western-style coffee or bagel, head to Lighthouse Cafe at Matta 570. • La Serena’s bus terminal is centrally located on the Panamerican highway, making it a great transit hub for just about any destination north to Arica or south to Santiago. 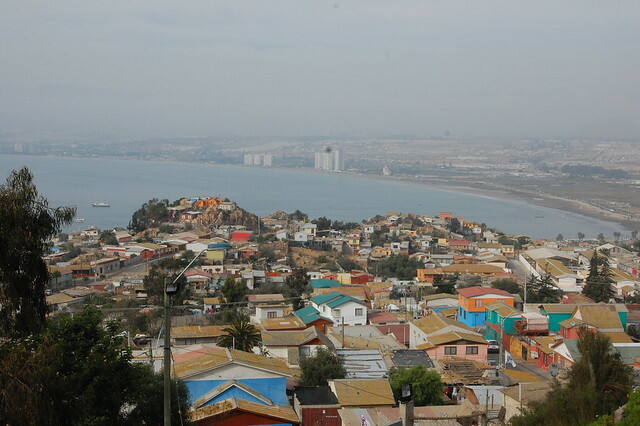 From here, you can also catch buses to nearby Ovalle or Tongoy, a popular beach resort. • To reach the Valle de Elqui, you can take a Via Elqui bus from the bus terminal, but their schedule is variable and irregular. For more regular bus service, catch a Sol de Elqui bus. The route begins at the bus stop across the street from Lider, near the Japanese garden, and continues along Avenida Brasil until the Unimarc parking lot next to La Recova, where it waits to pick up more passengers. It then continues its route and stops outside the other major market in La Serena. 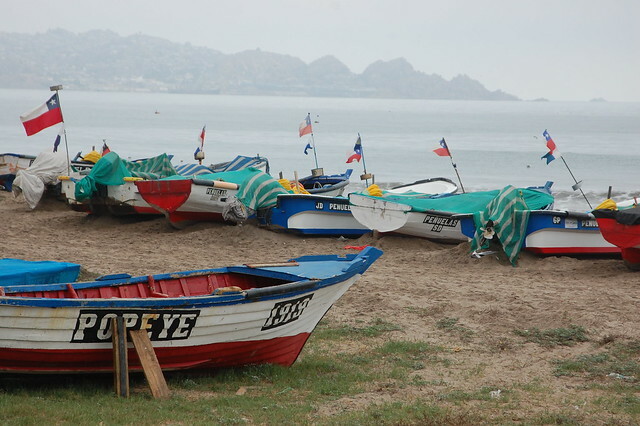 • To reach Coquimbo, you can take local buses along the Panamerican highway. Some buses from the Valle de Elqui end in Coquimbo. If you have time and energy, you can rent a bike and follow the bike path from El Faro in La Serena to the market in Coquimbo, but be aware that there is nowhere particularly safe to lock up your bike in Coquimbo.